Stainless steel toilet partitions use a #4 brushed stainless steel which promotes a hygienic environment while offering excellent corrosion resistance and a clean appearance. The corners are unmatched for their clean, attractive appearance. The superior strength of a full corner weld creates a hygienic seal and prevents parts from loosening and detaching. Partitions and Stalls has been a trusted name in the commercial toilet partition business for over 35 years. We’re eager to help with the configuration, selection, and purchase of stainless steel toilet partitions. Hadrian Toilet Partition Stainless Steel Ada Alcove Bathroom Partitions floor mounted overhead braced stalls. Alcove stall includes 36" door, 2 pilasters and panel. Doors can be either in or out swing. Standard chrome plated alloy hardware included. All toilet partitions ship in 48-72 hours plus 2-4 days travel. Hadrian partition stainless steel between wall bathroom partition stalls floor mounted overhead braced stalls with a smooth surface. Standard stalls 36" x 60" depth (26" door), ADA stall 60" x 60" depth (36" door). Standard chrome plated alloy hardware included. Doors can be either in or out swing. Up to 8 standard stalls total or 7 standard and 1 ada stall. All toilet partitions ship in 48-72 hours plus 2-4 days travel. To have an ADA stall you must select 1 ADA 24x60, plus 1 standard stall for 1 complete 60x60 ada stall. To have an ADA stall & standard stall, you must select 2 standard stalls and 1 ADA stall 24x60. Hadrian partition stainless steel corner bathroom partitions floor mounted overhead braced stalls with a smooth surface. Standard stalls 36" x 60" depth (26" door), ADA stall 60" x 60" depth (36" door). Standard chrome plated alloy hardware included. Doors can be either in or out swing. Up to 8 standard stalls total or 7 standard and 1 ada stall. All toilet partitions ship in 48-72 hours plus 2-4 days travel. To have an ADA stall you must select 1 ADA 24x60, plus 1 standard stall for 1 complete 60x60 ada stall. To have an ADA stall & standard stall, you must select 2 standard stalls and 1 ADA stall 24x60. 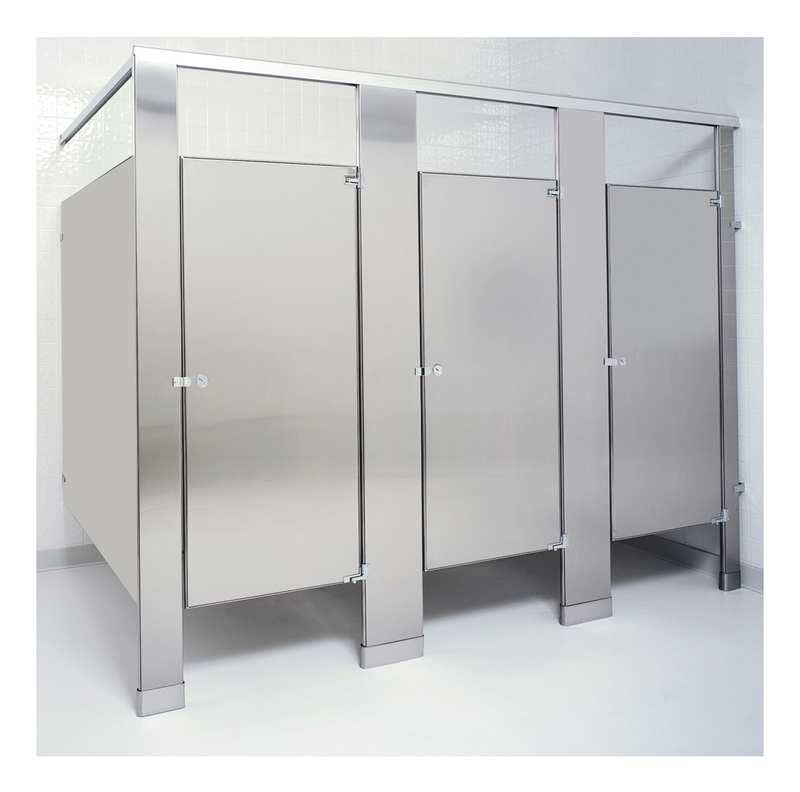 Hadrian partition stainless steel free standing bathroom stalls floor mounted overhead braced with a smooth surface. Standard stalls 36" x 60" depth (26" door), ADA stall 60" x 60" depth (36" door). Standard chrome plated alloy hardware included. Doors can be either in or out swing. Up to 8 standard stalls total or 7 standard and 1 ada stall. All toilet partitions ship in 48-72 hours plus 2-4 days travel. To have an ADA stall you must select 1 ADA 24x60, plus 1 standard stall for 1 complete 60x60 ada stall. To have an ADA stall & standard stall, you must select 2 standard stalls and 1 ADA stall 24x60. Global partitions complete stainless steel alcove partitions with overhead braced floor mounted stalls. Alcove stall includes 36" door, 2 pilasters and panel. Doors can be either in or out swing. Standard chrome plated alloy Hardware included. All toilet partitions ship in 48-72 hours plus 2-4 days travel. Global Partitions Complete Stainless Steel Between 2 Wall Partitions, Stainless Steel Overhead braced floor mounted stalls. Standard stalls 36"x 60"depth (26" door), ADA stall 60"x60"depth (36" door). Standard chrome plated alloy hardware included. Doors can be either in or out swing. Up to 8 standard stalls total or 7 standard and 1 ada stall. All toilet partitions ship in 48-72 hours plus 2-4 days travel. To have an ADA stall you must select 1 ADA 24x60, plus 1 standard stall for 1 complete 60x60 ada stall. To have an ADA stall & standard stall, you must select 2 standard stalls and 1 ADA stall 24x60. Global partitions complete stainless steel in a corner partitions with overhead braced floor mounted stalls. Standard stalls 36" x 60" depth (26" door), Ada stall 60" x 60" depth includes (36" door). Standard chrome plated alloy hardware included. Doors can be either in or out swing. Up to 8 standard stalls total or 7 standard and 1 Ada stall. All toilet partitions ship in 48-72 hours plus 2-4 days travel. To have an Ada stall you must select 1 Ada 24 x 60, plus 1 standard stall for 1 complete 60 x 60 ada stall. To have an Ada stall & standard stall, you must select 2 standard stalls and 1 Ada stall 24x60. Accurate Partitions Stainless Steel Ada Alcove Compartments. Stainless steel overhead braced floor mounted stalls are most commonly used. Alcove stall includes 36" door, 2 pilasters and panel. Doors can be either in or out swing. Standard chrome plated alloy hardware included. All toilet stalls ship in 48-72 hours plus 2-4 days travel. Accurates commercial stainless steel between walls bathroom partitions floor mounted overhead braced stalls with a smooth surface. Standard stalls 36" x 60" depth (26" door), ADA stall 60" x 60" depth (36" door). Standard chrome plated alloy hardware included. Doors can be either in or out swing. Up to 8 standard stalls total or 7 standard and 1 ada stall. All toilet partitions ship in 48-72 hours plus 2-4 days travel. To have an ADA stall you must select 1 ADA 24x60, plus 1 standard stall for 1 complete 60x60 ada stall. To have an ADA stall & standard stall, you must select 2 standard stalls and 1 ADA stall 24x60. Accurate stainless steel free standing stalls floor mounted overhead braced stalls with a smooth surface. Standard stalls are 36" x 60" depth (26" door), ADA stall 60" x 60" depth (36" door). Standard chrome plated alloy hardware included. Doors can be either in or out swing. Up to 8 standard stalls total or 7 standard and 1 ada stall. All toilet partitions ship in 48-72 hours plus 2-4 days travel. To have an ADA stall you must select 1 ADA 24x60, plus 1 standard stall for 1 complete 60x60 ada stall. To have an ADA stall & standard stall, you must select 2 standard stalls and 1 ADA stall 24x60. Global partitions stainless steel doors are manufactured in the USA. All toilet partitions ship in 48-72 hours plus 2-4 days travel. Note only 24, 26, 34 & 36 are quick ship, note 22, 28, 30 and 32 doors ship out after 1 week. Stainless Steel Doors Include: Hinges for 1-1/4" round edge pilaster, Bumper keeper hardware and turn latch locking system all in standard chrome plated finish. The size of the door is the exact opening width. All doors are 3/8" less than the opening for gapping.